I don’t like spiders, but if they’re not invading my territory, I try to leave them in peace. I figure they’re doing their bit to keep the erky insect/annoying fly population down. I don’t know what variety this one was, but unfortunately for it, it was invading my space. It was found unexpectedly waiting, having started weaving a web between my two undercover (“priority”) clothes lines outside my back door. I’m sorry spider-lovers, but this one was disruptive enough and scary-looking enough that it had to be disposed of. Very cute. I hope you gave it to a good home. 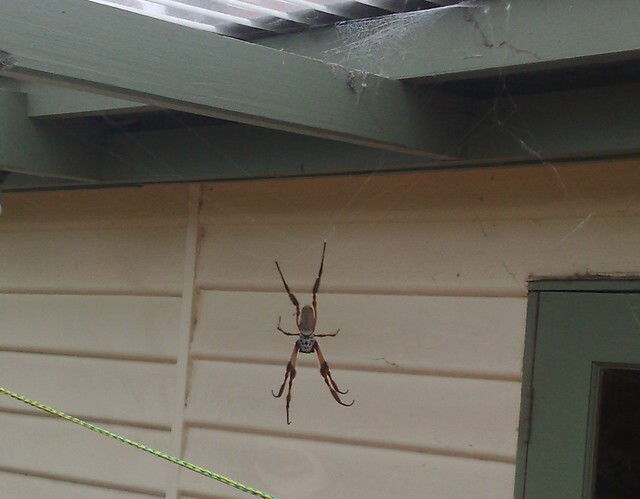 Probably a St. Andrews Cross spider. Harmless to humans but scary looking I agree. We used to get them when I lived up in FNQ on our veranda. There was a very large huntsman on our bedroom wall this morning. I know they are harmless, but neither Judy nor I liked the thought that tonight, it might try to join us in bed. I put a large cup over it, slid a large card underneath and tossed it into the garden. They might look scary but they are harmless to humans. I get the space-invasion thing, though. I never commit archanocide but simply put them into resettlement schemes. Fair enough. That’s what man-sized rubber thongs are used for when it’s too cold to have ’em on your feet. Death by a few frenzied flaps of rubber! Oh, no, Daniel. Please say that “disposing of it” didn’t mean killing it. I was quite bothered recently when I inadvertently walked into and destroyed a magnificent web stretching from the clothesline, that I didn’t see because the sun was directly behind it. If I’d seen it, I would have left it there and figured out some other way to get the clothes dry. Around the office, I’m usually the one they call for when someone has seen a spider and is freaking out, because I don’t mind picking them up and taking them outside. I’ve never been bitten. I was once on a safari ride at the Werribee Zoo, when the driver stopped and got out of the van and said, sorry, can’t go any further, there’s a great big huntsman on the rear vision mirror. I had to help retrieve the spider and put it outside so that the tour could continue. I thought that was pretty funny. The keepers aren’t scared of hippos or rhinos or anything, but are completely thrown by a little bitty spider. That’s a great spider photo that you took, BTW, Daniel. We have several in our garden and if they leave us alone we leave them alone. Everyone seems to have stories of garden weavers at the moment…are they newly around this year for some reason I wonder? Yes, also support the trapping and relocation method of dealing with spiders – although I am paranoid about suspected abscess causing species…. Just spent two days off work owing to having struck myself in the eye with a gardening fork when I panicked and tried to swat a spider off my face whilst I was gardening on the weekend. The saddest thing about it is that I didn’t even have a spider on my face to start off with.